Do you have some old Lincoln pennies? Are you specifically looking for the 1955 penny value? Think you might have the rare and valuable 1955 doubled die penny? How much are 1955 wheat pennies worth? These are all questions we’ll help you answer in this post. 1955 pennies are scarcely found in pocket change. They’re most often encountered in bank rolls, estates containing coin collections, and offered for sale by coin dealers. While 1955 wheat pennies are rather difficult to find in spare change these days, there are still plenty of them around. It’s just that most of the survivors are sitting in coin collections and coin hoards. It’s a good idea to save any 1955 pennies you find because, even though millions were made, they are still considered obsolete and may increase in value down the line. Many who collect the 1955 penny are aware that there was a significant error variety created that year: the 1955 doubled die penny. The 1955 doubled die error has been a significantly scarce collectible coin since it was first discovered in New England soon after the coins were minted. It is thought that about 40,000 were made in one evening at the Philadelphia Mint and that perhaps 20,000 to 24,000 entered circulation. Many were included in 23-cent cigarette packs, which were sold in quarter-only vending machines. The value of the 1955 doubled die penny rose quickly. 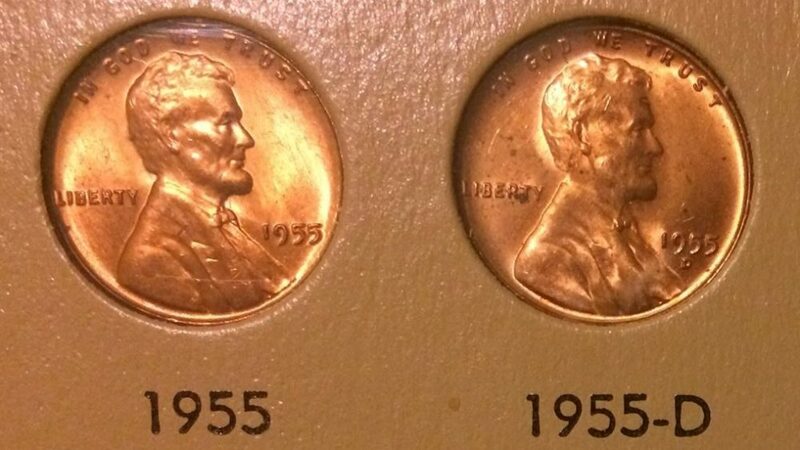 But why is a 1955 doubled die penny worth so much more than a regular 1955 penny? What’s a doubled die coin anyway? A doubled die coin is one of the most popular types of error coin varieties. The 1955 doubled die penny was even mentioned in a Stephen King novella called The Good Marriage, and was a plot device in the 1989 “Weird Al” Yankovic movie UHF. It’s important to remember that doubled die coins aren’t struck twice. Rather, it’s the die stamping the design onto blank coins that bears the doubled image. The doubled design was imparted on the die during the hubbing process — that’s when the devices used to strike blank coins are created. This is a good opportunity to also bring up 1955 Poor Man’s Doubled Die coins. These aren’t real 1955 doubled dies, but rather are coins that exhibit doubling, or ghosting, of the design due to die deterioration. The 1955 Poor Man’s Double Die coins might be great album hole fillers for the cash-strapped, desperate coin collector who can’t afford an actual 1955 doubled die cent. What Are 1955 Pennies Worth? Let’s talk a bit about what the different 1955 pennies are worth. Specifically, if you happened to find any 1955 pennies in pocket change that aren’t doubled dies, they’re likely rather worn and are therefore worth between 3 and 10 cents. *Values are for problem-free coins (no cleanings, holes, porosity, etc.) in circulated condition unless otherwise specified. Uncirculated 1955 pennies are worth more than the prices listed here. What Else Happened When Your 1955 Penny Was Made? Iconic British Prime Minister Winston Churchill resigned. The United States began sending aid to Vietnam. Rosa Parks refused to sit at the back of a bus in Montgomery, Alabama — setting off protests led by young Civil Rights leader Martin Luther King, Jr.
Actor James Dean died in a car crash at the age of 26. Albert Einstein died at the age of 76. In 1955, the average American worker earned $4,100, paid $1,900 for a new car, and spent 23 cents per gallon for gas.